Can the Rwanda film industry benefit from the Bpeace bump? 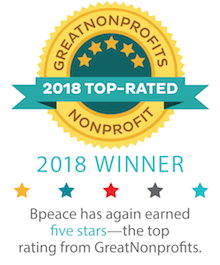 Bpeace was brought into this opportunity by Leah Warshawski, Executive Producer of the U.S.-based Inflatable Film, who is producing a feature length documentary: "Film Festival Rwanda" (working title), currently in post-production. Leah wants to help the budding Rwandan filmmakers she met build their businesses. Serendipitously, Ashley and Ann-Elise had contacted Bpeace inquiring if they could be of assist to our work in Rwanda this summer. We took an opportunity from column 1 with another in column 2 and ta da: the Bpeace Rwanda Film First project begins. Laurie Chock, Bpeace Board member and documentary filmmaker, and Bpeace's Chief Program Officer Marla Gitterman helped prepare Ashley and Ann Elise for their fact-finding expedition. Upon their return, we'll decide if Bpeace will move ahead with this project and how to involve more Bpeacers. Ashely and Ann-Elise will be posting on Twitter: @aeharden and @aefrancis87.